San Francisco International Airport officially entered the jet age with the first commercial jet service provided by Trans World Airlines with the Boeing 707-120 in March, 1959. Along with the jet airliner came the Jetway. San Francisco International was one of the first airports in the world to install a jet bridge. (Atlanta’s first Jetway came only one week prior.) American installed them for their 707s and soon after United installed them for their Douglas DC-8 fleet on July 29, 1959. The DC-8s, and later Boeing 720s, would park parallel to the terminal, allowing two Jetways to be used. It was later realized that parking face-in would be a more efficient use of space. British Overseas Airways Corporation’ (a precursor to British Airways) began their worldwide LHR-JFK-SFO-HNL--HND-HKG route using Boeing 707-420s in 1959. In 1960, Lufthansa began service to SFO using Boeing 707-320s. Other Asian and European airlines gradually replaced their propliners with jet aircraft during this time. Pan Am began the first all-jet cargo service in the early 1960s. By 1962, the jet age was in full swing at San Francisco International, with SFO becoming the 4th busiest airport in the nation. Runway 28 Left was lengthened in order to accommodate the heavier jet aircraft. The new South Terminal opened in 1963, starting a growing trend that would encompass the parking lot over the course of several decades, giving it the distinctive circular shape seen today. The South Terminal contained the already existing E Pier, and two more piers. The F Pier contained two satellites, one to the east and one to the west (not shown). Trans World Airlines used the eastern satellite, and Continental and Eastern used the western satellite. The G Pier was used by Pan Am. With the opening, Western moved along with Pan Am, TWA, Continental, and international carriers. Soon afterwards, Pan Am built a base at SFO, composed of a maintenance center, service center, and offices. In 1964 a parking structure opened. A new airline emerged at SFO, the SFO Helicopter Airlines. Formed in 1961, the SFO Helicopter Airlines offered flights from and to various points on San Francisco and Oakland. In the above photograph, there are three Sikorsky S-61s. They used a small fleet of Sikorsky S-61s and S-62, along with a hovercraft and, later, Bell 206s. SFO Helicopter has the distinction of being “the first scheduled air cushion vehicle passenger operation in the United States.” They folded in the 80s. 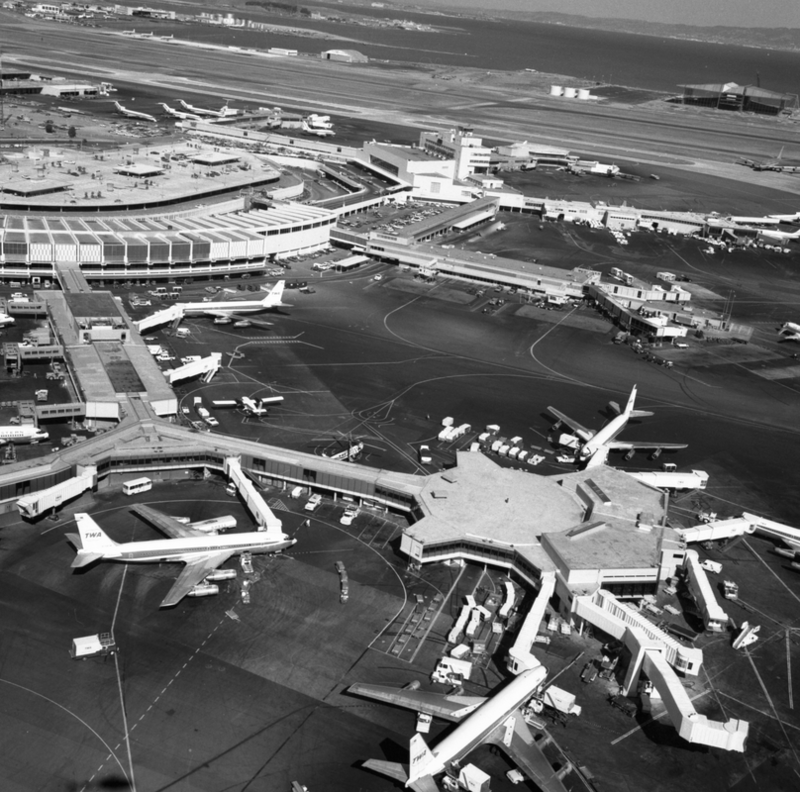 In 1966, San Francisco International reached the ten million annual passengers mark. By then, the United Service Organization opened a lounge catering to the personnel of the United States Armed Forces. The Boeing 747 first visited SFO on December 21, 1969. Although a Pan Am 747-100 was the first 747 to visit, TWA started the first scheduled 747 service. On January 5, 1970, Shirley Temple Black christened the 747 N93104, named the “City of San Francisco,” with champagne. In order to handle the first widebody, TWA enlarged part of their satellite and added Jetways. American Airlines added two sets of double Jetways in order to handle their 747 fleet. The first Douglas DC-10 service (by United) started in 1971, followed by the Lockheed L1011 in 1972 (by TWA). By 1972, a large hangar, situated near the threshold of runway 19 Right was complete. Named the “Superbay,” the hangar was built to fit TWA’s and American’s 747s, but United eventually acquired part of it for their 747s. The Superbay is one of the most recognizable buildings at SFO, and remains here today. The Superbay is behind the Golden Gate Airlines DHC-7. In 1974, a Rotunda at Pier G was complete. Originally called Rotunda G, it would be renamed Rotunda A in 1979. Rotunda G could hold six 747s, and was attached to Pier G by a narrow walkway. Rotunda G became the International Terminal. 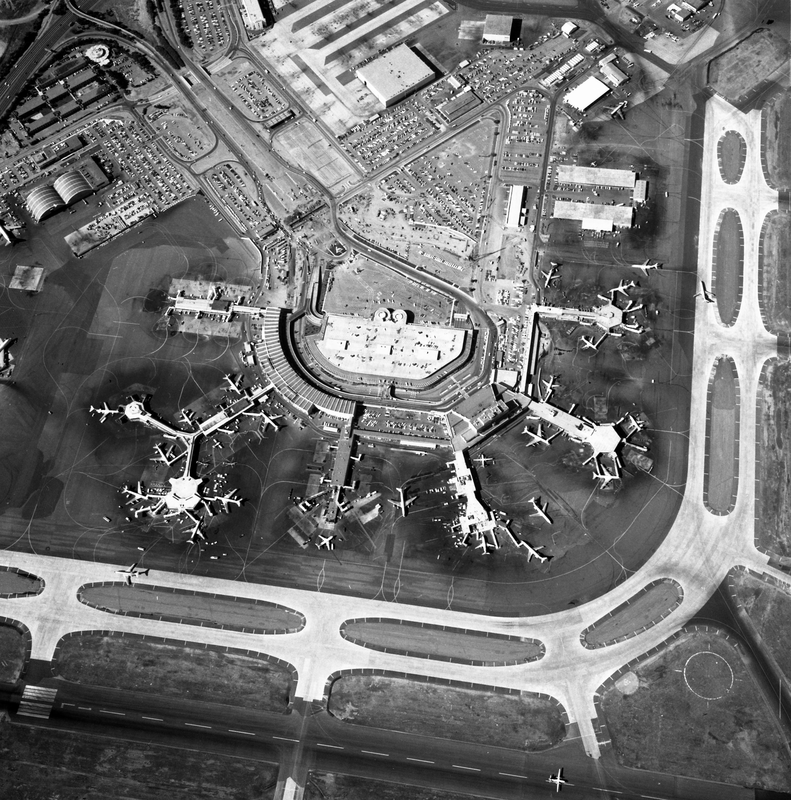 Throughout the years, SFO had plans for expansions, some of which never happened. A diagram of SFO in 1968 called for 7 Rotundas and an additional two oval gating structures. Another called for an expansion into the bay and the creation of a “Cargo City” as large as the terminal area. In addition, SFO’s four runways are in pairs, and only 750 feet apart (from centerline to centerline). Because of this, there have been numerous designs for new runways more spaced apart, giving greater separation and allowing simultaneous arrivals in IFR weather conditions. Unfortunately, this plan will probably never will come due to environmentalists protesting and the cost of such undertakings. As part of its west coast tour, one Concorde visited San Francisco International. 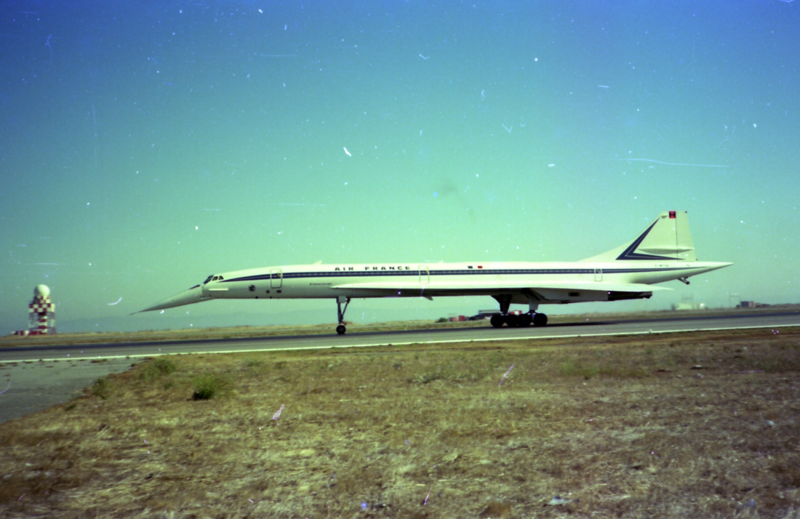 F-WTSC, Concorde 2, landed in 1974. The visit was the first, and currently the last, visit of a supersonic transport (SST) at SFO. During the 70s, a Television show was filmed at SFO, and was actually about events happening at the airport itself. San Francisco International was, unfortunately, unsuccessful and NBC cancelled it after a few episodes. The show does go behind the scenes of SFO, giving the audience a unique perspective of the operations at one of the busiest airports in the nation.